For 2010, Suzuki Canada Inc. has announced two new Sport Touring additions to their motorcycle line-up; the all-new Suzuki GSX1250FA and GSX1250SEA editions. Test rides won't be available until next season so for now we'll focus on the specifications and some overall impressions, combined with some details provided by Suzuki. 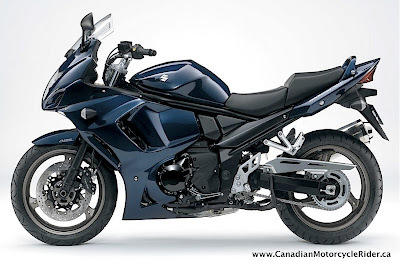 Actually, we had a GSX1250SEA last year in Canada too; it's hard to tell from the pictures on the Suzuki website but it looks like the fairing and headlight have been revised for 2010. The photo's of the 2010 model look really great. The engine is blacked out for 2010 so it gives the bike a different look as well. It looks a little sportier; a little more athletic to us. It bears a closer resemblance to the more sport oriented GSXR 600, 750, and 1000's. Based on the big 1255cc Bandit these editions bring even more value to what is already a stellar bargain of a bike. The full fairing, and available luggage turns this bike into a competent sport touring machine with more weather protection than the half-fairing model offered. What remains is the proven chassis and 1250cc engine. The engine is a DOHC, liquid cooled, fuel injected in line four. Plenty of power for touring and to-up riding, yet it's a very manageable bike at the same time. Boldly styled and impressively powerful, but comfortable and user-friendly. The new GSX1250FA (ABS) provides a full 1255 cubic cm engine to provide ample torque for both the sport and touring focused rider. It features a dramatic, neatly integrated look featuring a distinctive full fairing. With all-round performance and exceptional value, the GSX1250FA is an exciting new addition to the sport touring category with a focus on sporting comfort. Understanding the versatility and appeal of this new model, Suzuki Canada is also releasing a full touring version (GSX1250SEA) that shares all the key elements of the GSX1250FA with the addition of removable hard side and top cases as well as chromed bar end weights. The easily removable cases allow the transformation of the bike from a touring focused bike to a more sport oriented application. The headlights are a vertically stacked with multi-reflector halogen bulbs while suspension is by way of 43mm stanchion tube forks in the front and a single shock in the rear. Both the front and the rear are spring-preload adjustable so that you can make adjustments for riding solo or carrying a passenger. The instrument cluster features a big analog tachometer and a digital speedometer. Just the way it should be in my opinion. You even get a gear-position indicator and shift light. It also comes standard with a center stand; making chain maintenance much more convenient. The seat height is user adjustable and has 20mm of range up for down by removing, flipping over, and re-installing a clever mounting spacer between the seat and the frame seat rails. • 1255cc fuel injected, liquid cooled engine tailored to deliver smooth acceleration and broad power, generating peak torque at a low rpm range. • Functional full fairing, housing vertically stacked headlights and shaped for a neatly integrated look when combined with the fuel tank and tail section. • Classic tube-frame chassis, with rake and trail chosen for an excellent balance between sporty handling and highway cruising comfort. • Digital Antilock Braking System (ABS) monitors wheel speed and matches stopping power to available traction. Colors: Candy Blue, Metallic Oort Gray, and Pearl Nebular Black. For additional articles involving Suzuki motorcycles check out our Suzuki article category HERE.